It's not often we see President Obama wear his emotions on his sleeve. For the past four years, we've seen his passion for serving the people of America. When he's upset about an inactive Congress or people hurt by natural disasters or mass shootings, we can see it on his face. But he remains SO cool in the midst of it all! 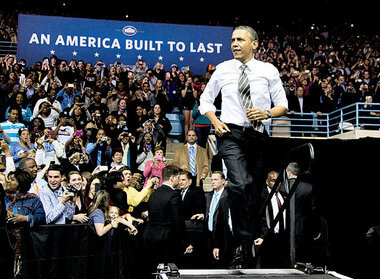 Yesterday, the world got to see the president in a raw and authentic state at his campaign headquarters in Chicago. President Obama takes the mic to thank his campaign team and supporters and you can see the room is full of young people. He takes the time to explain his past when he moved to Chicago at 25, as a community organizer. He thanks the young people for working just as hard as he did, if not better. Then he becomes emotional. Watch the video and be moved like the rest of us!